Nissan CEO Carlos Ghosn attended a groundbreaking ceremony last week in Smyrna, Tenn., for the plant that will make battery packs for the Leaf. 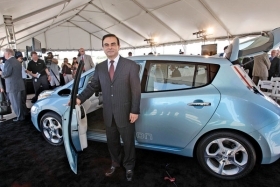 Ghosn is among the auto industry's most enthusiastic backers of electric vehicles. SMYRNA, Tenn. -- Owners of Toyota Motor Corp.'s fuel-efficient Prius hybrid will succumb to the charms of the Nissan Leaf electric sedan, predicts Nissan Division Vice President Al Castignetti. More than half of the 130,000 hand-raisers who have expressed an interest in the Leaf so far have been Prius owners, he said. "That's a pretty significant signal to us," Castignetti said here last week as Nissan North America Inc. broke ground for a Leaf assembly line and battery factory. "It tells us that there is a segment of eco-friendly consumers who are interested in going to the next level. They own a hybrid vehicle. But if the next step is available, they want to take it." Castignetti said the early customer enthusiasm has helped warm some Nissan dealers to selling electric vehicles. "At first, some of them were probably a little skeptical about EVs because they were dealing with the unknown," he said. "But the consumer response -- including phone calls from people responding to seeing the Leaf in our TV ads -- has gotten them pretty pumped up about it now." Nissan now is telling dealers what will be required of them to sell the electric car. Most retailers must install three charging stations: one in their service area, one in their lot where cars are delivered by truck and a third on the property where owners can stop by for easy charger access. Large stores will require a fourth charger, Castignetti said, and small stores will have to install only two.